Click above to participate in our annual campaign right now. Help us reach $225,000 by Pesach! A Yeshiva with the foundation of Tomchei Tmimim values, that incorporates high level studies in Limudei Kodesh for average to advanced Bochurim, together with an option for a full secular skills (Limudei Chol) curriculum, culminating in a NY State Regents High School Diploma. We achieve this without the compromises that often result from programs that are not full day Kodesh. The underlying premise is to maintain an environment true to Chabad values on all levels. Families can choose between the Kodesh only track or the option to earn a high school diploma. Each year Lev Tmimim empowers young men with tools and perspectives to aim high towards a life of leadership. Our program is built around the belief that by creating a non judgmental atmosphere, but with clear requirements and expectations without compromising on values, and holding our Talmidim accountable to the high standards that they are truly capable of, we can instill in them an appreciation for the gifts that are bestowed upon each one of us from Above. If your son is completing 7th grade this year and going into his Bar Mitzvah year, he may apply to our Mechina Shiur. This program is open to a limited number of Talmidim with strong learning skills and Chassidishe Hanhoga who are in their Bar Mitzvah year, and are seeking to develop in their learning, Avodah, and personal growth in a true Mesivta environment. 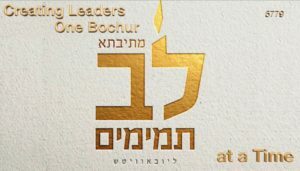 If you are seeking a Smicha program combined with a rewarding and meaningful Shlichus of working with young Bochurim and helping them grow as Tmimim, please contact us to inquire into our Smicha program now going into its fourth successful year. We welcome out of town students with full dormitory accommodations. Only an hour away from Crown Heights, your son can be in an out of town Yeshiva but still close enough to home.